A sumptuous rose gold-plated stainless steel bracelet watch from American fashion label Tommy Hilfiger. Styled with a silver tone arabic dial featuring the iconic flag logo at 12 o'clock. 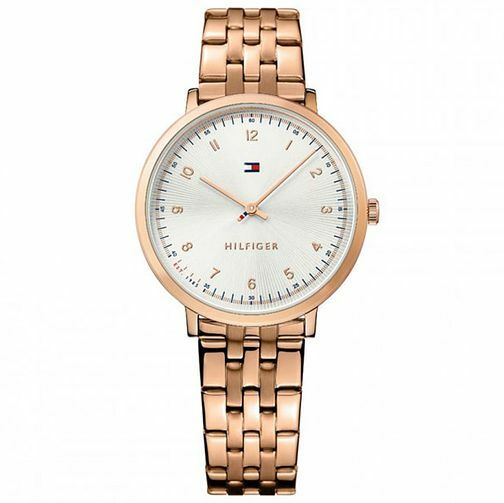 Tommy Hilfiger Silver Dial Rose Gold-Plated Bracelet Watch is rated 5.0 out of 5 by 1. Rated 5 out of 5 by Anonymous from This product is perfect, I'd recommend it to others I love my new Tommy Hilfiger Watch. It has great features. Staff at H Samuel was very friendly.